There’s no denying it that for the majority of women and men, that having a tan makes you feel better about yourself. Normally in winter I am pale white, meaning I reach for my skinny tan and applicator and apply a layer of fake tan. Once dry I am left with a non-human looking colour filled with patches and streaks which needless to say was not the desired look. 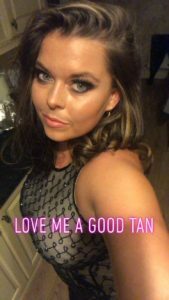 This year I decided to try a sunbed, yes at first I was sceptical with all the health warnings etc but what can’t you do these days without it affecting you in some way. I researched some tips for safety and was ready to find some where to go. I simply typed in Sunbeds South Yorkshire, a variety of local salons popped up, then I saw sunbed hire. As I had previously hired a UVB unit from Anytime Sunbeds earlier in the year it seemed a logical choice to give them a call again. I didn’t want to travel back and forth to salons, pay by minutes and knowing how red I get when I’m hot or been working out (which is rare) I wanted to spare myself the embarrassment. After plucking up the courage to dial the number I got through to Paul who instantly recognised me and put me at ease. I explained I had never used a sunbed at home. After deciding on a date for delivery I was ready. I forgot to mention that the reason I wanted to look tanned was my Christmas work do creeping up. Id booked in my hair for a total restyle and wanted to look hot! (No pun intended). I had 8 weeks to prepare, and I wanted to do this the right way, I told Paul my reasons and he suggested I try some creams to help boost my tan. Starting off the sunbed I got was the Black Shadow????? Paul explained this sunbed was good for people who haven’t used sunbeds before, he said this was good to build a base tan and isn’t as hot as the others he has. 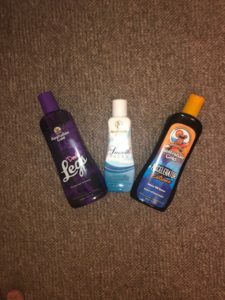 As I was a little apprehensive I wanted to start my tanning experience correctly and use what is best for my skin tone. I also purchased the Body Butter Karat cream which I absolutely loved! not only does this cream firm your skin and leave it super soft, it smells amazing and seeps straight in to your skin which Is something I actually look for in a cream. Paul gave me a good rota to stick to, 3 to 4 times per week, start at 5 minutes then as I feel more confident, up my time gradually. 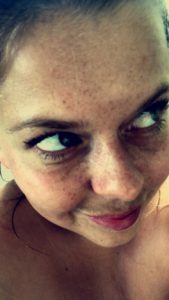 I noticed a difference straight away especially on my face as my freckles appeared immediately. 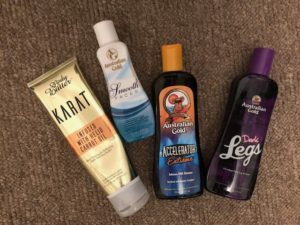 I forgot this happens when I’m in the sun (as it had been ages since I had been on holiday) To me, I think they’re cute, so I felt that feeling you have when your tanned on holiday, however this was in my back room, ha-ha who knew. This sunbed was cool, literally, the fans blowing air out at me which left me feeling calm and relaxed, I thought it would be quite claustrophobic but I was totally chilled and I believe this was thanks to the fans and an epic RNB mix on Spotify. I continued with this regime for about 4 weeks in total and even though I was tanned I wanted to be a bit darker. When Paul came to collect the sunbed I asked him about the different types of beds he has. 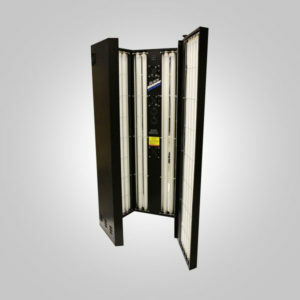 Within a week I agreed to rent the VX vertical sunbed. I again purchased some other creams to ‘accelerate’ my final three/four weeks of tanning before my work’s do. So I thought the first sun bed was good, this new sunbed took my tanning to a whole other level. People at work were asking if I’d be on holiday, almost every day someone different said I looked tanned. Yes!!!! This is what I wanted a real tan that will stay longer than a few days. 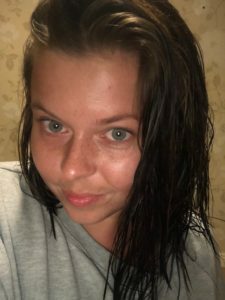 I had 4 different creams this time, I wanted to make sure my skin was moisturised and if they helped the tan then why not. I even got one specifically for your face, I am a firm believer that you should always use a face cream and it’s a special type of skin? By this time you could see a true difference and I couldn’t have been happier! The sheer joy of having this device in my own home and being able to see the results made it the best £200 I’ve ever spent, plus the £30 for the enhancing creams. To me the creams are a must, I have dry skin anyway but the effect they have plus the conditioning of the skin seems a no brainer. As my work do was swiftly approaching it was time to say goodbye to Mr Sun. As I work 9-5 Paul came to collect the sun bed whilst I was at work. When I returned I was greeted by a sad empty looking room. (I GENUINELY MISS THE SUNBED) My work do came and with a mixture of tequila and compliments my mission was complete. Even now 4 weeks later people are still saying how tanned I look. The next big event to prepare for is my wedding!!! I will be calling Paul again! !